When winter arrives, you may notice stores stocking up on big bags of salt. Or maybe you noticed trucks driving down the streets pouring out salt onto the streets. Icy sidewalks and roadways are a disaster waiting to happen. From a simple slip to a major car accident, it is important to keep our roads deiced. Road salt is a popular deicer during the winter months. However, have you ever thought about the effects road salt has on more than the ice it melts. It is a well-known fact that deicers wreak havoc on our cars and concrete surfaces, but what about the environment? You may think salt is salt, but road salt is different than the table salt or kosher salt on your dinner table. Rock salt can be made of a variety of chemicals and materials designed to prevent ice from forming and melt already existing ice. Deicers work by decreasing the freezing point of water. Ice is made of water and adding salt to that water creates salt water. The freezing point of salt water is lower than pure water, so scattering salt on top of ice or snow accelerates the melting process and makes roads safer sooner. It is estimated that more than 22 million tons are scattered on U.S roads annually. That’s about 137 points of salt for every American. And all this salt has to go somewhere. After it dissolves, the sodium and chloride ions are split and carried away in the runoff. The water is deposited into streams, lakes, rivers, and groundwater. Look at how easily rock salt corrodes your car. Or how it sticks to your shoes every time you walk outside. Rock salt is not only a personal problem, it is also an environmental problem. Canada categorized road salt as a toxin and placed guidelines on its use. As the U.S continues urbanizing, rock salt will be used in higher quantities to cover the growing number of roads. The mounting piles of salt that we dump are getting the environment into more trouble than ever. A big concern with road salt is how it affects water quality. Road salt doesn’t just disappear. It seeps into groundwater and lingers for a long time. It also washes into our lakes and streams. This goes into the water that we drink. Water companies often have to deal with complaints about salty drinking water during the winter, where chloride concentrations can exceed 250 parts per million. It’s a bigger problem for people on salt restrictive diets. Road salt isn’t just a problem in our sinks. In New Hampshire, the Department of Transportation had to replace over 400 private wells as a result of road salt. In Minnesota, 70% of salt applied to roads stays within the region’s watershed. Once road salt contaminates something, it is very difficult and expensive to remove. It also sticks in our lakes and ponds. Elevated salt concentrations can reduce water circulation, preventing oxygen from reaching the bottom layers of water. It also interferes with the natural chemistry of the water, reducing nutrient load. Changes in the salt content of a pond or lake can also affect the way the water mixes when the seasons change. The result is the formation of salty pockets near the bottom and biological dead zones in the water. When it splashes on the road, rock salt can erode the soil and damage trees and vegetation as far as 650 feet away. Roadside vegetation absorbs chloride through their roots or from accumulating it on their branches and leaves. Because of this, leaf damage and death are very common along roadways as a result of road salt. The symptoms associated with salt exposure are similar to drought. Think about how thirsty you feel after eating a salty meal. Now imagine you are a plant that doesn’t have access to non-salty water. Stunted growth, brown and falling leaves/needles, dying limbs, and premature plant death are common results of excess salt exposure. Granted, the level of chloride that must be reached before the plant is harmed is different for each type of vegetation. Planners can also use salt-tolerant vegetation new the road’s edge to lessen the impact of salt. Saltwater can also lead to salt toxicity in birds and mammals. The buildup of salt on roadsides can turn into an artificial salt lick that is attractive to mammals and birds. It is also extremely dangerous for freshwater aquatic organisms. Chloride concentrations above 800ppm are harmful to most freshwater aquatic organisms. These high levels interfere with how the animals regulate the uptake of salt into their bodies. After the snow melts, wetlands near highways surpass these levels. High levels of salt also form a layer of salt at the bottom of lakes and ponds. This layer takes valuable nutrients away from plants and animals that live in water. Chloride from road salt also negatively impacts the survival rates of crustaceans, amphibians, fish, plants, and other organisms around lakes. How Can You Use an Eco-Friendly Alternative? There are many different ways you can take to care for your parking lot and the surrounding environment. You can start with using road salt sparingly and widely. Instead of using a lot of road salt everywhere, place it on the areas you most frequently walk. You can also shovel well and often instead of using deicers. 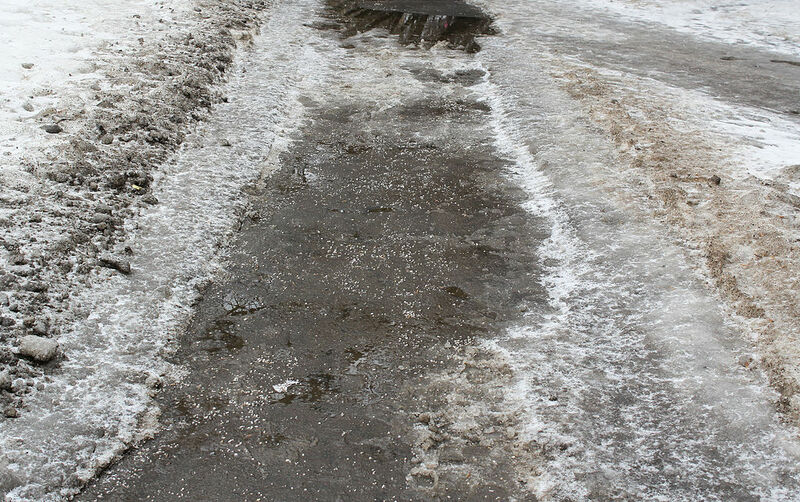 If you are looking to protect your driveway from ice, add traction by using kitty litter or sand. However, what about the roads we drive on? There are also alternatives to road salt. Beet wastewater, leftover from sugar beet processing, cheese brine, pickle juice and potato juice are some of the unconventional deicers being tested. The carbohydrates in beet wastewater are more effective at lowering temperatures in salt water and brine alone, lowering the melting point of the ice and reducing the amount of chloride applied to the road. A downside, however, is that some communities don’t like the smell, which can be likened to soy sauce, molasses or stale coffee. It also adds sugar to aquatic ecosystems, encouraging bacteria growth. In Wisconsin, cheese brine, a waste product of cheesemaking, is used. Molasses mixed with a saline solution is another option used. A Canadian company also uses granules from volcanic rock, which helps melt ice because the dark color absorbs heat. It also adds traction by embedding into ice and snow. There are also eary tests that use solar power to help melt ice and snow so they so they won’t need to be plowed or chemically removed. Call Bravo! Concrete Maintenance Today! Winter is coming! Ask about our technologically advanced sealers with Advanced Salt Protection. Protect your investment from oil stains, efflorescence, freeze/thaw and road salt intrusions. These penetrating sealers will strengthen and densify your concrete for many years eliminating sealing on a yearly basis.